This is book is about a group of Mermaids who move on land to escape a war going on in the sea. All is great until a few new Mers show up, and one of them starts using siren powers to control a human teenager. This is a really interesting take on Mermaid lore that pulls in the Little Mermaid story (The original one, not the Disney version with a happy ending) and builds off this premise with a curse and Mermaid wars that followed in Arial’s wake (no pun intended). My one little quibble in this book is that there is a love triangle, and (as usual) the girl picks the wrong guy for me. I don’t know why, but inevitably when there is a love triangle involved, I am disappointed because I would have picked the other guy. Oh, well. Despite that, this is a fun read. 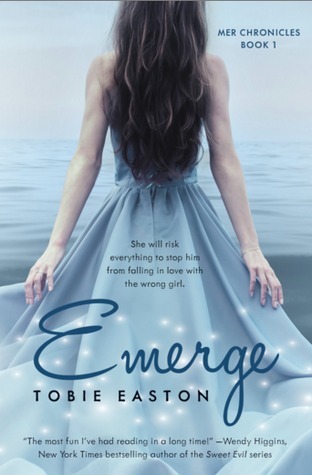 This entry was posted in Book/Movie Review and tagged emerge, jennifer eaton, jennifer M. Eaton, mermaid book, mermaids, Review, tobie easton. Bookmark the permalink. I really enjoyed this book. I found it to be one of the best mermaid books out there. I didn’t find it too fluffy but enough so that teen girls would enjoy it.